With pleasure we welcome you at MYTHOS PALACE, a classy hotel that lies on the longer golden sandy beach of Crete, in Georgioupolis. 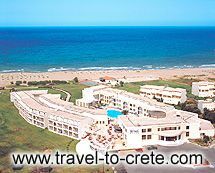 Plan your holidays to Crete and visit us. 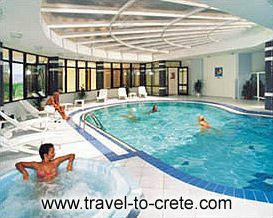 The management team and our friendly staff will be at your service to make your stay at Crete as pleasant and memorable as possible. 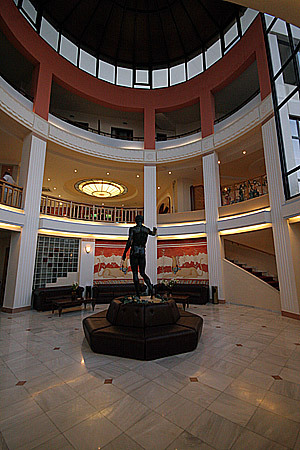 For the rest, please enjoy a small conductor tour at the interior of MYTHOS PALACE. Crete, the largest Greek island with the unique cultural and historical treasures and the greatest contrasts: Clear blue seas and high wild mountains, deep gorges and golden sandy beaches. In Crete was born the Minoan Civilization, the beginning of the European Culture. Hear Zeus, the king of gods, was raised in a cave on the highest mountain of Crete named Psiloritis. Hear the spirit of Ikaros who wanted to fly and touch the sky is alive. 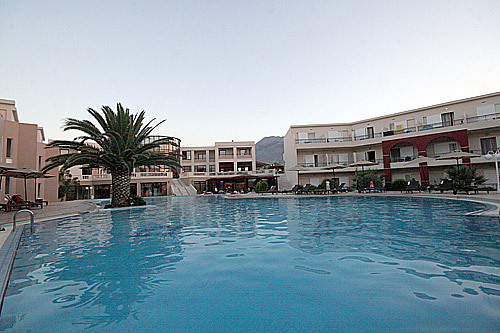 The friendliness and kindness with the famous hospitality of the Cretan people is renowned. Their delightful behavior with the spectacular Mediterranean climate with over of 300 days of sunshine each year, makes your holidays unforgettable. 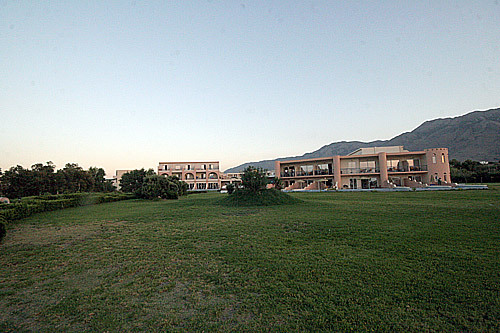 Built using modern and traditional Cretan style. 31 Suites (2-3 Beds) with 1 or 2 Bedrooms and extra sitting room. 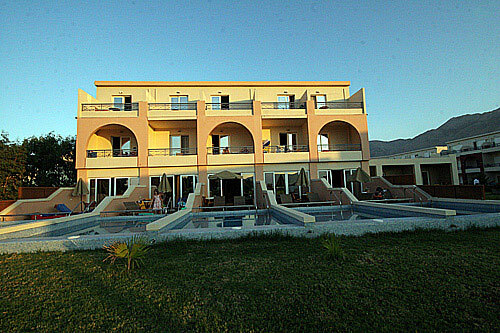 2 Cretan style Villas with private swimming pools and sitting room. 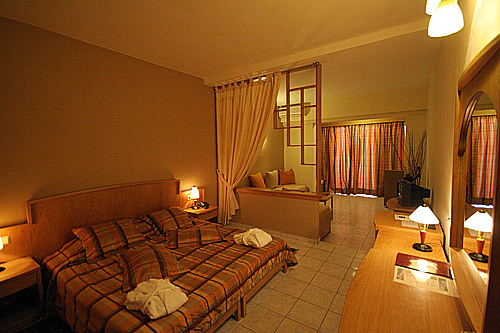 Individual Air Condition (hot and cold): Each room has individually controlled. Mini Bar: Available in each room. Music: Accessible through the music channels of your television set. Bathroom: you will find: - Full marble bath with hairdryer. - Special outlet for electric shaver 110 volts. - Two-sided make up mirror. - Cord to hang clothes. Main Restaurant - Buffet style. Piano Bar with sea and river view. Beach Bar Snack Bar at the beach. Swimming pool with fresh water. 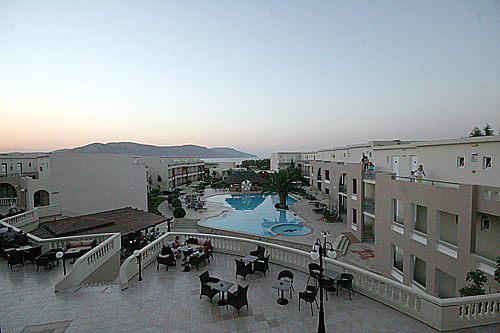 Health Center: including indoor pool, hammam, massage, sauna and fitness center. Conference Room (up to 50 people). Mini Club: ages 4-8 and Game Room. Small private park with various animals. 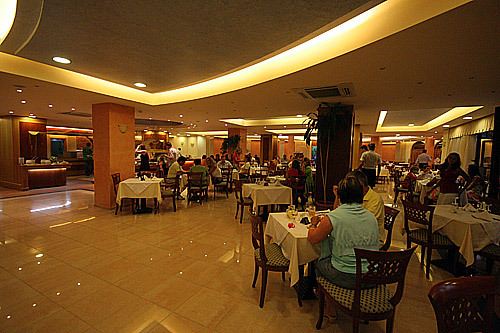 Bacchus: Main Restaurant for breakfast and dinner in rich American buffet style. 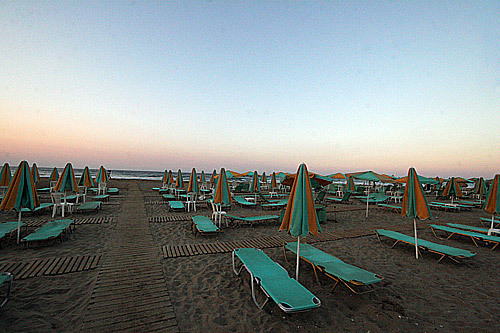 Argo: Tavern and Snack Bar at the beach for lunch and for drinks during the whole day. 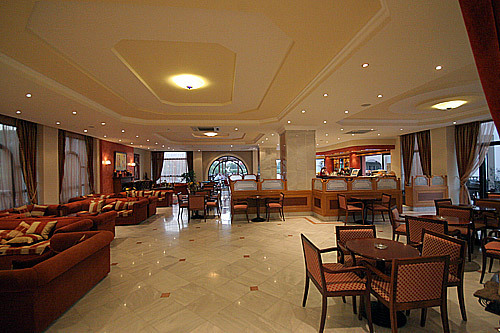 Dionysos: Main Bar: Open during the day and until late ant night, often with nightly entertainment programs. Children's Special Needs: Special meals and high chairs available. Sport Activities: Tennis Court - Ping Pong -Beach Volley - Water Sports - Scuba Diving - Water Polo: you can enjoy a variety of water sports by visiting the water sports center located on the beach. 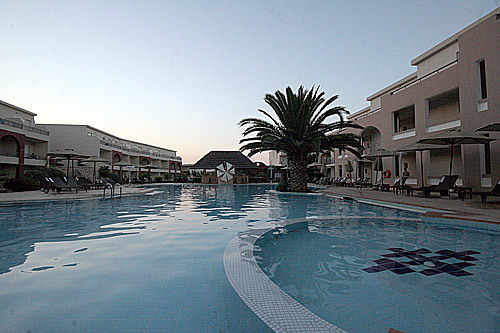 - Pool: Adult and Children' s pool available. - Horseback Riding: All the necessary arrangements can be made at the Reception Desk. The Health Center, with its qualified staff, offer face and body treatments, and massage for our guests. You can also keep in shape by visiting our fitness center as well as swimming in the indoor pool Relax, with a dip in the Jacuzzi or perhaps you prefer the sauna or hammam. We also provide safe tanning in the solarium.